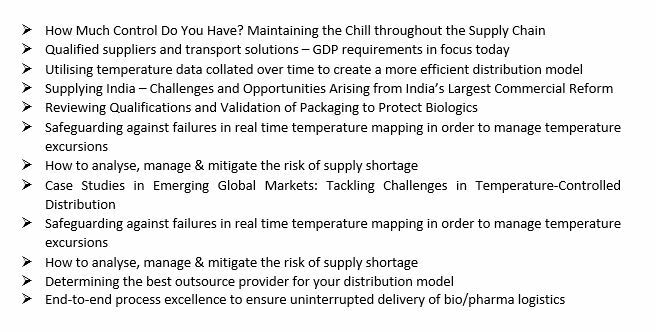 CSS 2017 (Cool Supply System & Solutions 2017) has been in motion as an annual event for the past five years serving as a platform for premier Bio/Pharma Logistics providers involved in providing services and solutions within the Time & Temperature Controlled Logistics segment. CSS has gained a reputation as a platform for developing new contacts, direct sales & business development and strategic marketing. ​We are inviting you to explore Sponsorship and Exhibition Opportunities and get involved in the largest Time & Temperature Controlled Logistics Symposium in Europe. 1. The Speaker invitation is exclusively dedicated to Bio/Pharma companies. 2. The Exhibition Invitation is exclusively dedicated to GDP compliant Service & Solution Providers.